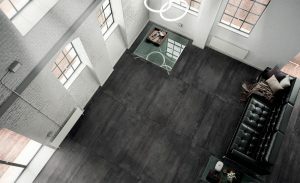 This collection can work with many applications including lobbies, kitchens, bathrooms – you name it. The range of sizes also allows you to create color on color patterns with the 6″x36″ and 18″x36″. (6″x36″ could border a large field of 18″x36″ or the have a grouping of 6″x36″ in herringbone pattern create a path through the 18″x36″ field.) Another unique element to the collection is the Wood colorway – perfect if you’re looking to cover a wall with a reclaimed wood aesthetic but don’t want to deal with the cumbersome nature of reclaimed wood. 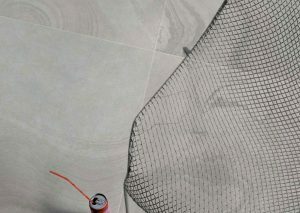 With this tile, you know what you will get, and for a restaurant or bathroom application it is perfect because it is easy to clean. 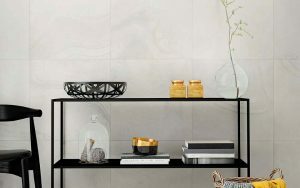 S/tones is a contemporary interpretation of real stone. Its palette is composed of four neutral colors; off-white, grey, olive green and graphite. Its appearance reminds me of a drawing session in which we focused on ink wash paintings. I remember the way the India ink would pool on the paper and how its consistency would change when water was added. The different areas where the color pools on the tile takes on similar characteristics to ink wash paintings. Much like Blocks 5.0, above, the S/tones collection can work in a variety of applications; lobbies, kitchens, bathrooms – you name it. 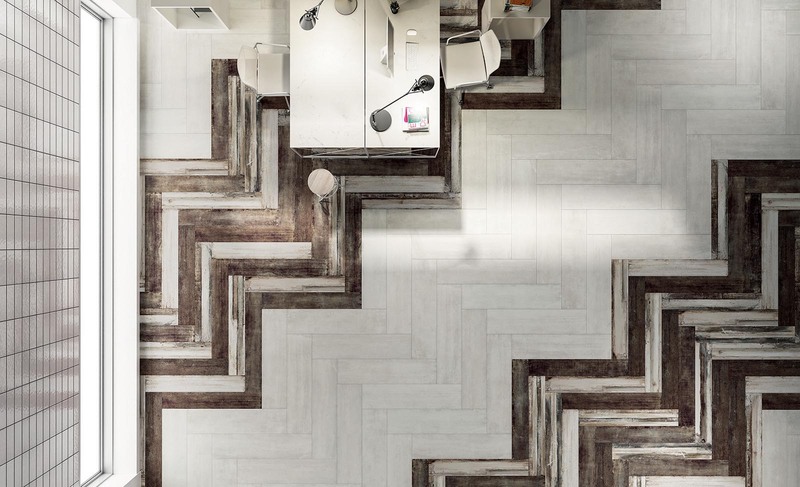 Offering a range of rectangular and square formats in a slightly different portion than we typically see, it allows you to create staggered patterns or straight set layouts with a contemporary stone aesthetic.